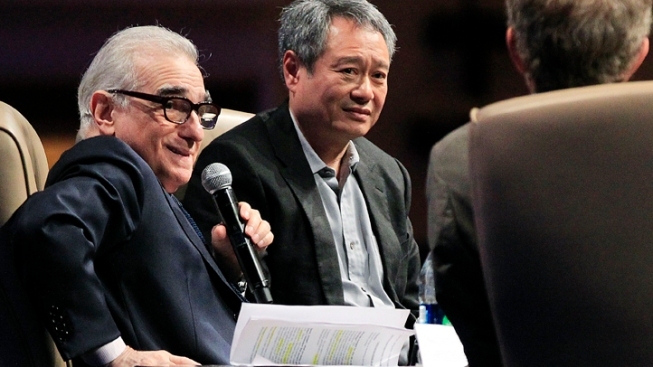 Scorsese spoke at the CinemaCon convention in Las Vegas on Wednesday. Martin Scorsese has become so enamored with 3-D filmmaking that he expects to use the technology in all his future projects. The Academy Award-winning director of "The Departed" told a crowd of theater owners at the CinemaCon convention in Las Vegas on Wednesday that he wishes his landmark films "Raging Bull" and "Taxi Driver" had been three-dimensional. Scorsese is so convinced of the power of 3-D, he said he only saw "Hugo," his first 3-D movie released to critical acclaim last year, once in 2-D.
"There is something that 3-D gives to the picture that takes you into another land and you stay there and it's a good place to be," he said. Scorsese spoke at a filmmaking panel alongside director Ang Lee, who won an Oscar in 2006 for the gay cowboy love story "Brokeback Mountain." Scorsese and Lee are among a growing crop of prominent directors who claim 3-D technology is the future of filmmaking. Scorsese said the added dimension of digital films allows movie fans to feel a stronger connection to the story and actors on screen. He recalled filming "Hugo" and watching as Sacha Baron Cohen, who portrayed a stern train station inspector, leaned forward on set, and the motion that created on a monitor. "He sort of came right off the screen and we sort of felt like we were little kids again," Scorsese said. Scorsese said he never thought he would have the opportunity to make a 3-D film. He said conquering the technology was challenging at first, but he ultimately decided to experiment as much as possible and watched 3-D versions of Alfred Hitchcock's "Dial M for Murder" and "The House of Wax," the 1953 horror film, for inspiration. "Hugo," based on Brian Selznick's award-winning "The Invention of Hugo Cabret," an illustrated novel about a Parisian boy and a broken automaton, won several technical Oscars at this year's Academy Awards and earned the most nominations, including a best director nod. "It's like seeing a moving sculpture of the actor and it's almost like a combination of theater and film combined and it immerses you in the story more," Scorsese said. "I saw audiences care about the people more." Scorsese and Lee lamented how inaccessible 3-D technology is to low-budget or independent filmmakers. Lee, whose "Life of Pi" 3-D fantasy adventure is set to be released in December, said learning to tell a story with the multidimensional technology required everyone on set to reimagine the boundaries of film, including the lowliest crew members. "The technology improves so fast. Like every three months you are behind," Lee said. "The learning curve is really humongous." Scorsese compared 3-D to the rise of color movies. He said as a film student at New York University in the early 1960s, he was shocked when he heard predictions that all future movies would be filmed in color. He said anyone harboring doubts about the rising influence of 3-D technology should consider how color movies have taken over the industry. The 3-D craze allows filmmakers to accomplish the original goals of cinema, Scorsese said. "The minute it started people wanted three things: color, sound and depth," Scorsese said. "You want to recreate life." Lee also urged theater owners to continue investing in their movie houses. Adapting to digital projectors has been a challenge for some small and independent theater owners. "Keep them open," Lee said. "Especially with 3-D, this is a new era coming. We have to keep up with it."